The rumors were true: Google launched the Nexus 7 tablet on Wednesday at its annual Google I/O developer event in San Francisco. Nexus 7 is available directly from Google(s goog) in the Google Play store alongside the $399 GSM Galaxy Nexus smartphone. The new thin slate is mostly as expected although the company opted for six icons in the launch bar instead of the four often seen on Android phones. Asus built the Google-designed hardware, which will be available in two capacities, 16 GB and 32 GB, priced at $199 and $249. Included with the Nexus 7 is a $25 credit for the Google Play store. The 7-inch screen with wide angle viewing uses a 1280 x 800 resolution and scratch-resistance glass from Corning (s glw). There is no memory expansion slot. A 1.2 megapixel camera sits on the front of the device and there is no rear camera. Google says the 4325 mAh battery should last for around 8 hours; not bad for a small tablet. Nexus 7 weighs 340 grams (12 ounces) and measures 198.5 x 120 x 10.45 millimeters (7.8″ x 4.7″ x 0.41′”) or about the same as competing 7-inch slates. Of course, Google is shipping the Nexus 7 with its latest software, Android 4.1 or Jelly Bean, also introduced at the event. Nvidia’s(s nvda) Tegra 3 quad-core processor powers the device, which also includes 1 GB of memory. Support for NFC, Wi-Fi 802.11b/g/n, Bluetooth and a GPS are part of the Nexus as well. Essentially, everything but a cellular radio for traditional voice and mobile broadband is included, although the integrated microphone can be used for VoIP calls. Nice to see that the UK pricing is reasonable: Â£159 for 8GB and Â£199 for 16GB. Plus a Â£15 Play store credit. I was expecting a straight price translation from dollars to pounds sterling. I love the fact that it’s a 7 inch tablet and wifi only. That’s all I want at the moment. Since we still don’t have the Kindle Fire on this side of the pond, this tablet is very attractive. Harry, I really don’t look at the Nexus 7 as a competitor to either the iPad or the Surface. The PlayBook yes, but that’s dying a slow painful death, sadly. Nexus 7 is squarely targeted at the Kindle Fire and Nook Tablet IMO. I disagree on PlayBook comment. I think RIM will make a successful comeback to smartphone industry. PlayBook is heading to right direction after 2.0. I personally can’t wait till BlackBerry 10. Can it connect to 3g or 4g ? No 3G or 4G radio in the Nexus 7. Some will see that as a bad thing, of course. On the plus side, it cuts the carriers out of the device equation and gives Google total control over the device and experience. An extra service for your tablet is too expensive IMO (I’ve been paying $50 a month for years, with a netbook plan before my Xoom). Most people spend most of their time under wi-fi coverage and for the few other times everybody will soon have a phone with a hot spot feature and that’s more economical and simpler on billing anyway. I love cutting the carries out. The carriers are as pleasant to deal with as the IRS. You can always pair it with your phone or use a hotspot. It’s no sale for me without a microSD slot. WTF! That put me off too, but I ordered one. 16 GB due to the lack of memory expansion. I think I’m going for the 16gb myself. I wonder whether or not a USB drive would suffice as a portable media storage compliment. Any android device that has ICS or above supports USB storage, so you CAN use external USB storage with it if you absolutely need more space for some reason. Definitely not as convenient as microSD, but it’s an option. It is actually 8GB and 16GB on the Play Store. This is Google’s first tablet. Then why the name Nexus 7. Shouldn’t it be Nexus 1 tablet? Its called Nexus 7 because of 7-inch screen. 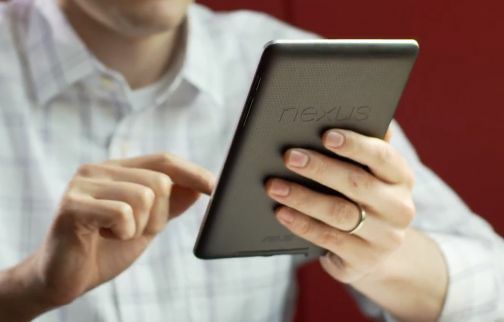 Google is also developing 10-inch tablet to compete against Apple’s ipad.